have made before and to be able to bring a few more skills and get the dimensions right. 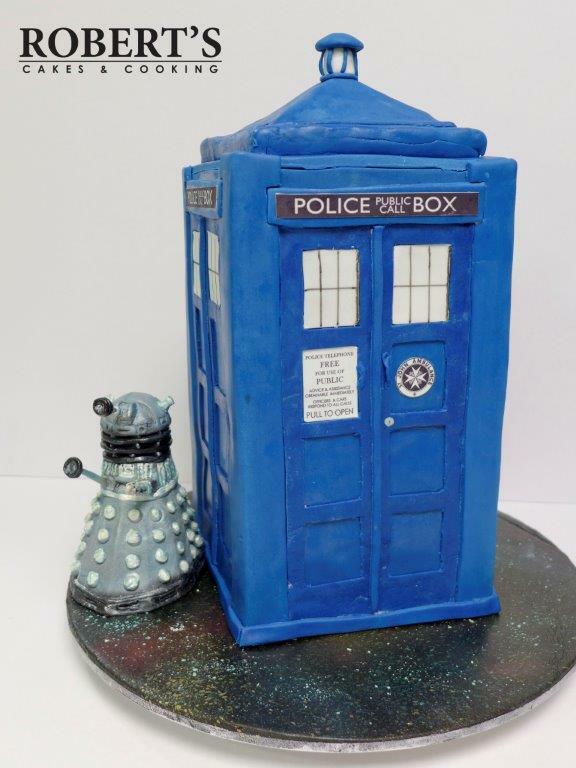 The TARDIS is Homemade fondant on an “orange velvet” cake filled and covered in dark chocolate orange ganache. 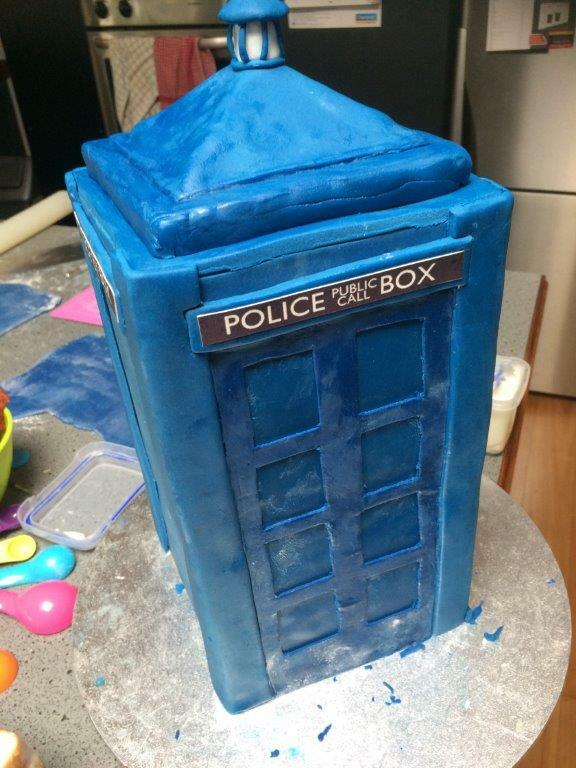 The board is covered in white fondant then baked for 10 minutes at 80C to set it hard before it was airbrushed with food colour to look like a galaxy. The signage is icing sheets printed with edible ink. 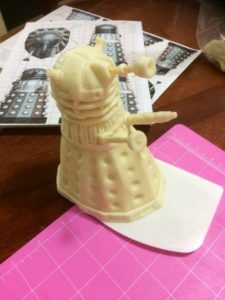 I made the Dalek from homemade modelling chocolate. 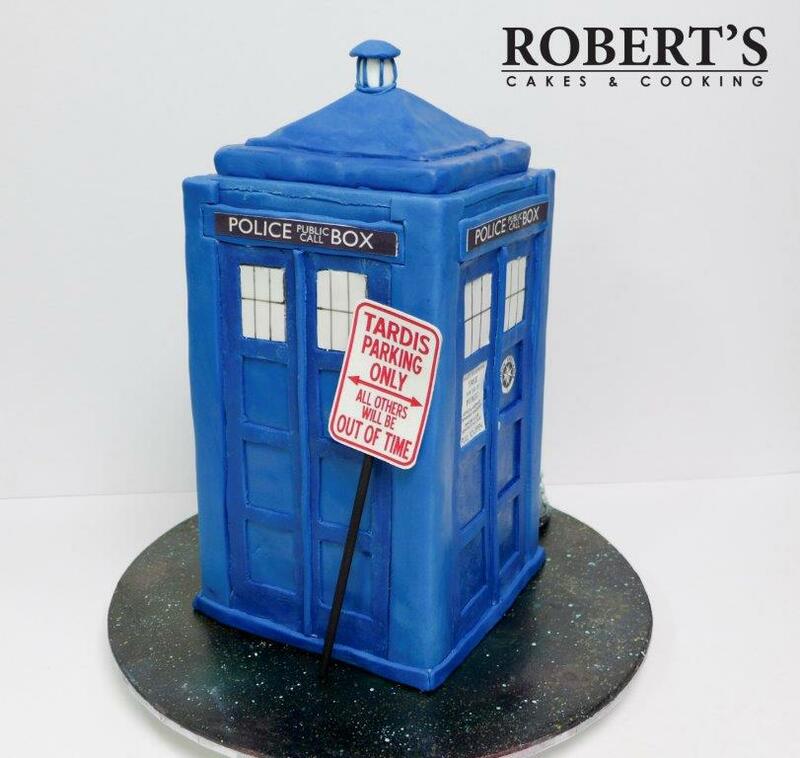 I adore doing geek culture cakes because scale drawings of the main characters are really easy to find. 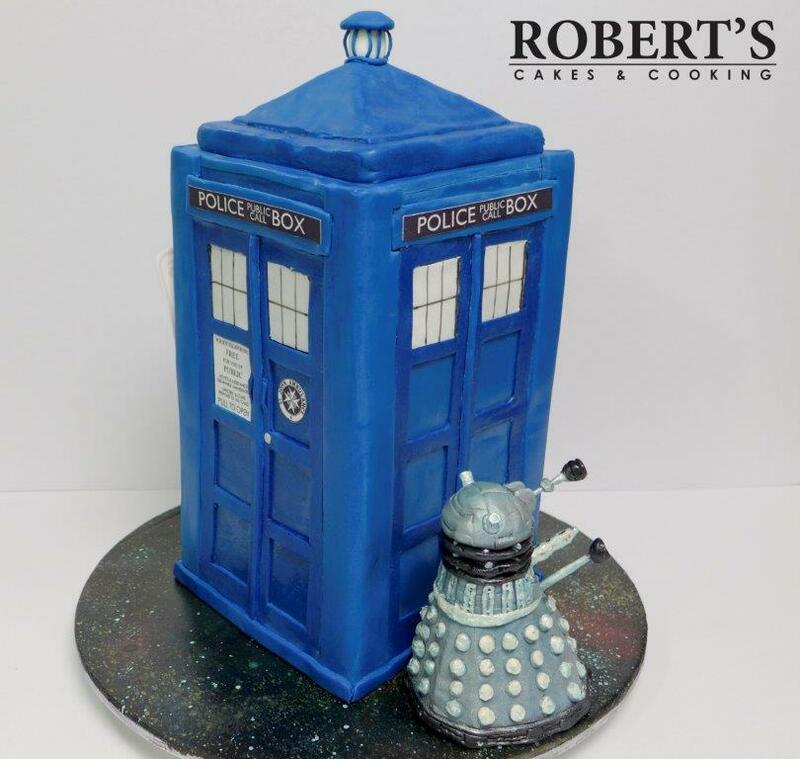 I print or trace the source material to the size I am going to make the cake or figure so I can use it to check to make sure the proportions are correct as I’,m making the cake. 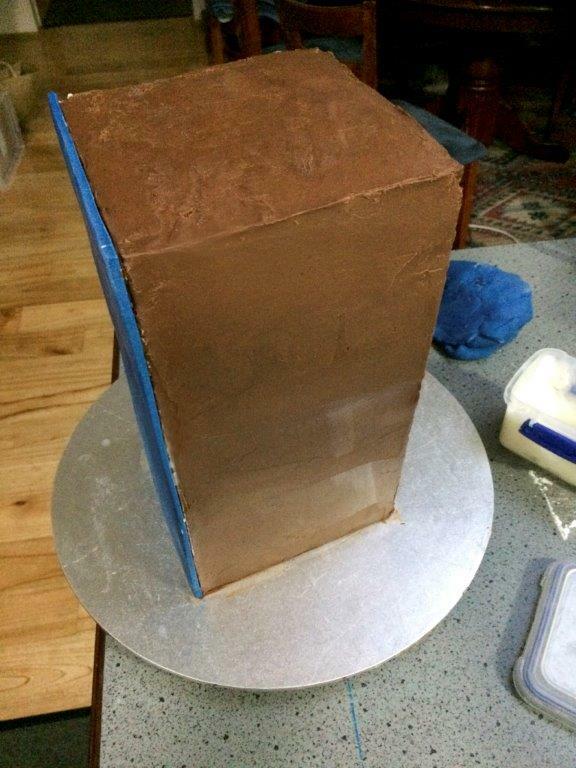 Detailed photos of the construction of the cake below 🙂 It’s rougher than it should be, but I’m really happy with the overall proportions and given the small amount of time I left myself to bake and decorate this cake it came together well. 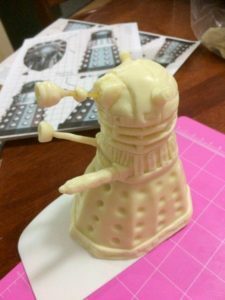 Dalek being sculpted from homemade modelling chocolate. The “arms” are made of pasta so it is 100% edible. The image I used to get the proportions correct is in the background. 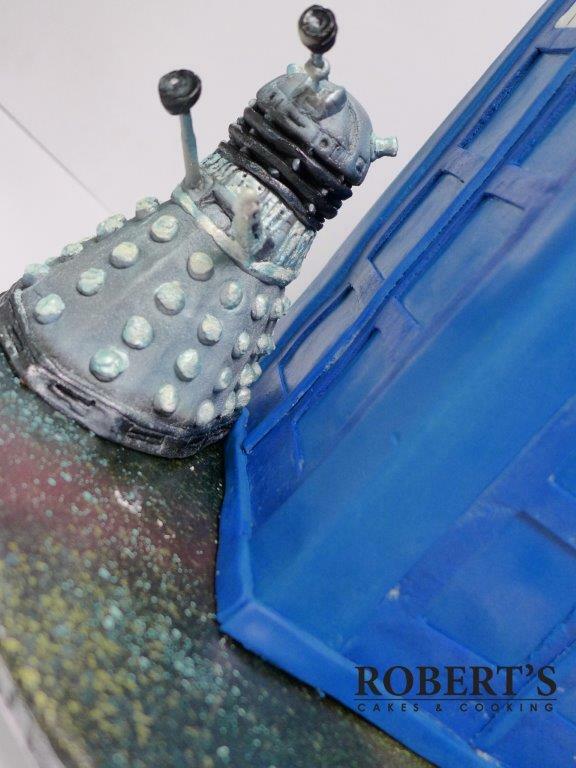 I painted the Dalek with edible shimmer petal dusts and alcohol and set colours with steam, allowed the model to dry then sprayed it with confectioner’s glaze. 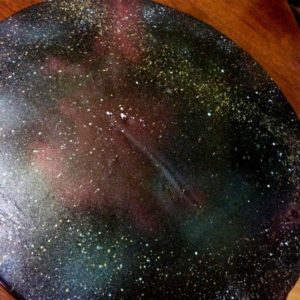 I airbrushed a galaxy onto a fondant covered board. 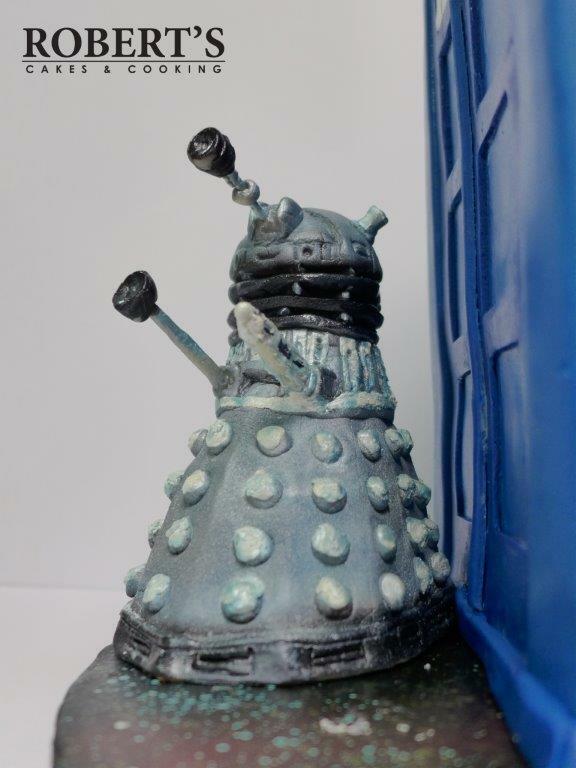 It was super fun playing with all the different colours and metallics mixed with decorator’s alcohol to see what I could get through the airbrush. 6 inch square orange velvet cakes. There is a 5inch Board on top of the 4th layer supported by three dowels. 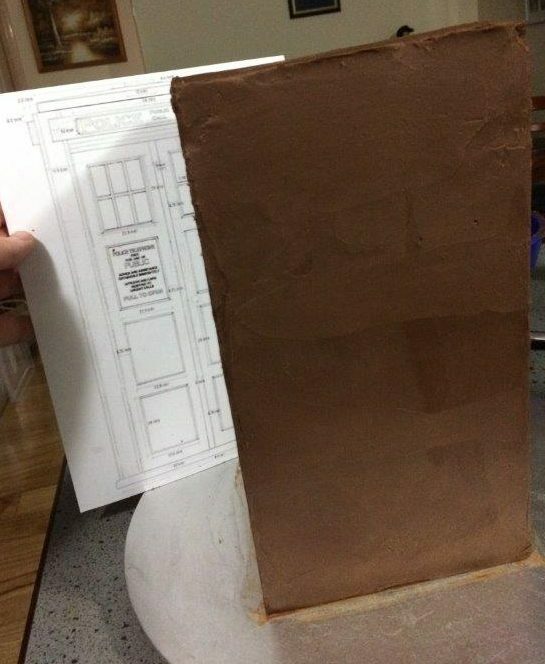 I used a printed scaled up diagram to keep me on track for the dimensions and proportions, and referred back to it regularly. It really helped. Covered with orange chocolate ganache, there was a lot of micro-zested orange zest added to the ganache to give it a bright fresh orange flavour. 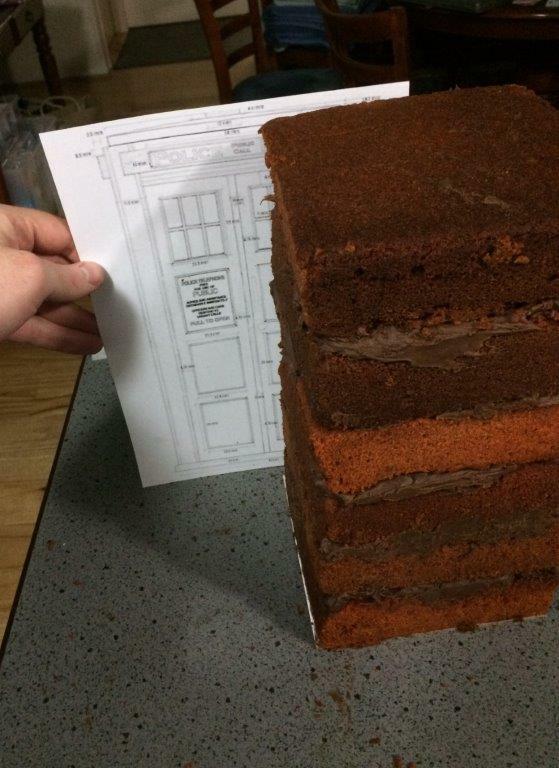 The ganached cake was just under 13 inches tall. 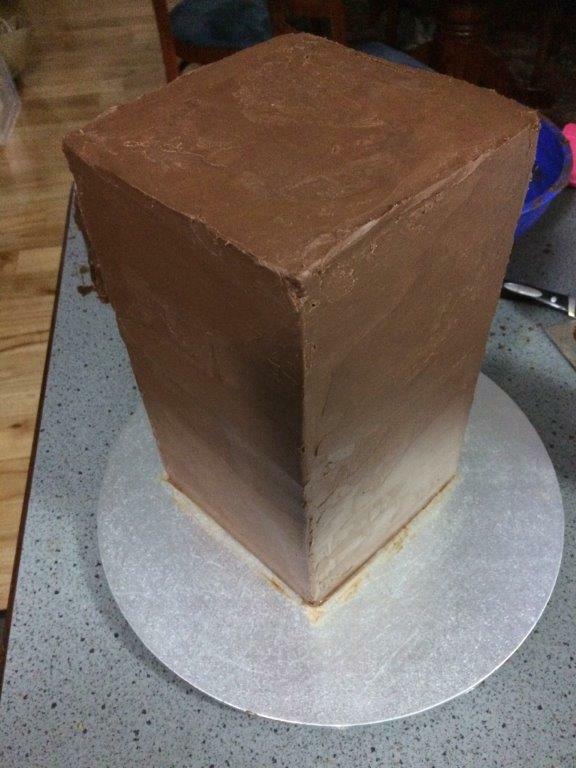 It was taller than my ganache scraper, I managed to get it pretty sharp mostly freehanding it. Reconfirming the ganached cake is still on track. 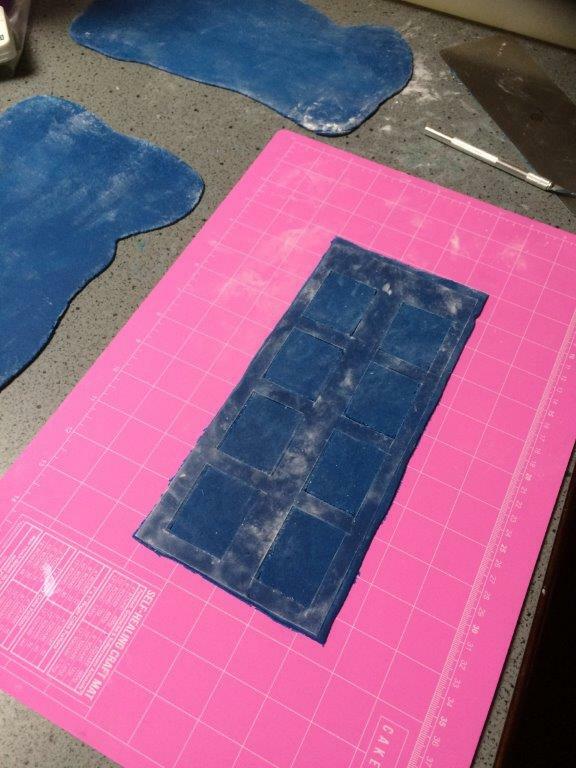 Paneling with homemade fondant. Very happy with how straight the sides are. Although, the corners get covered anyway… It’s always nice when things line up perfectly. Cutting out the door paneling detail. Started running out of time at this point, so they ended up rougher than I would have liked. The process I used worked well. These sections overlay the side panels to create the window detail. Applied the cutout panel. Just need to steam it a little more and add more details. 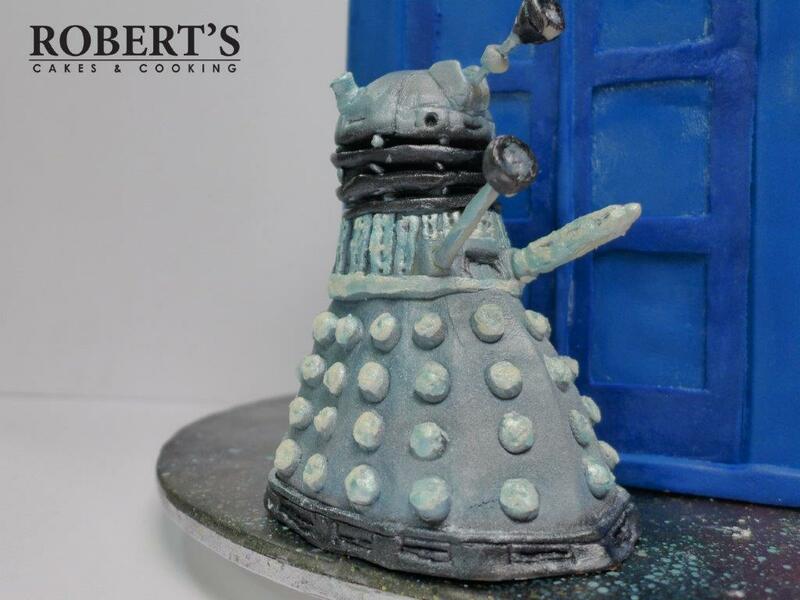 And the shakiest video ever taken of a cake… this was the result of doing almost all the decorating including making and applying the fondant in under 4 hours…. after almost no sleep…. 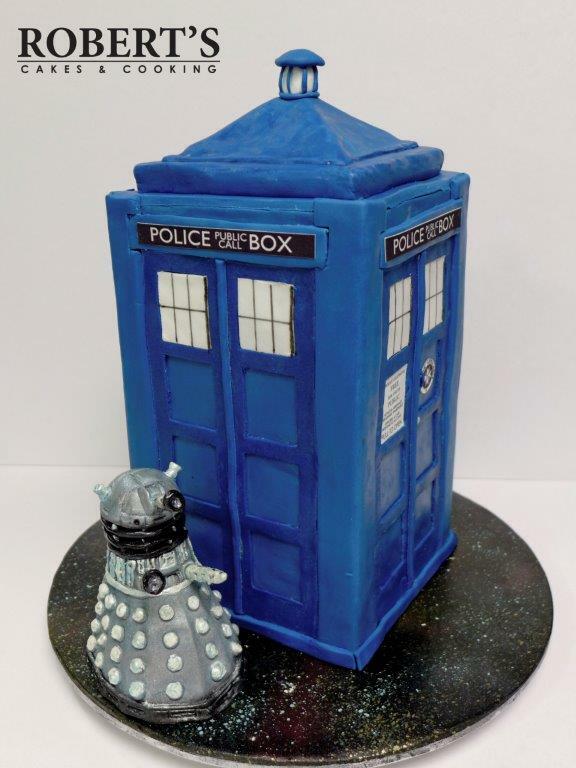 the ganache was made, the cake was cooked and the Dalek made on Friday night after work. 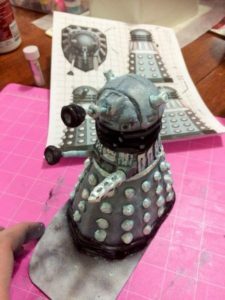 On Saturday morning I had a Cake decorator’s club meeting I couldn’t miss. 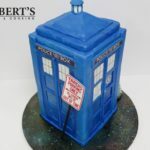 I got home at 2pm, made the fondant, applied the ganache, fondant and finished the decorating in 4 hours flat got in the car and delivered the cake to my friend’s place and enjoyed an incredible Dr Who themed 31st birthday party. It was a costume party complete with a Dr Who pub quiz style quiz for the guests. It was a blast!